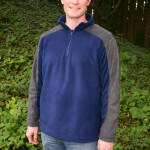 I have been meaning to write up this broad shoulder adjustment for raglan style tops for a long time. I have broad shoulders. This means that 99% of most women’s t-shirts available in stores don’t fit me. There was a time when I would only ask for v-neck or deep scoop necks on any gifted shirts. Sadly, these don’t always work either! 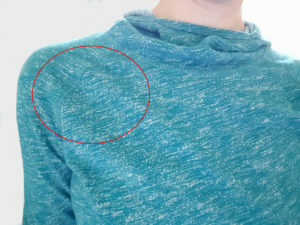 When I try on a raglan style shirt in the store, I often see diagonal wrinkles radiating from the shoulder toward my bust. Sometimes I’ll see a horizontal wrinkle across my upper back, but that doesn’t happen as often. Here is an example of a RTW shirt that shows diagonal pulling. 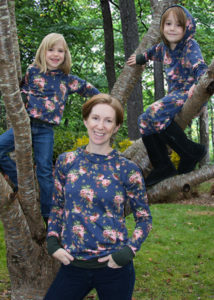 When I started designing the Nancy Raglan, I was pretty excited because raglans are really comfortable to me. In ready-to-wear, I still have pulling across the front and back of my shoulders, but it’s not nearly as obvious as typical t-shirts. 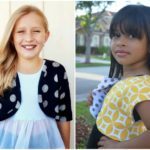 Before we get started, it’s important to note that fabric choice can make a BIG difference on whether or not you need to alter the pattern at all. A very stretchy lightweight jersey might do just fine without an adjustment, whereas a stiff cotton lycra might need the adjustment. I highly suggest making a muslin (a practice version) of the pattern in a similar fabric as your final fabric! I have seen a few different methods for doing a broad shoulder adjustment for raglan style tops, but I didn’t want to change the intersection between the shoulder and the shirt because this is one detail that sets raglans apart from each other. So, I concentrated on changing the sleeves only. 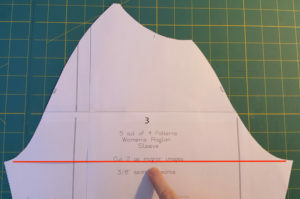 This part is really important: We’re going to be using the pivot method to make the shoulder piece wider, so when you make your cut lines, do NOT cut all the way through the edge of your pattern piece! Stop as close to the edge as you feel comfortable. All cuts (after the first one) occur from the midpoint of the sleeve (found by matching the underarm points) to a particular spot (directions are below). 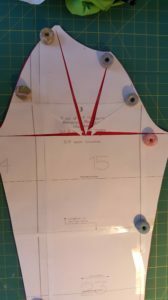 Put together the sleeve portion and lay it out flat in front of you. Your first cut will be from underarm point across to the other underarm point. REMEMBER – DO NOT CUT ALL THE WAY THROUGH THE PATTERN AT EITHER END! Cut from the midpoint of the 1st cut to halfway up the back of the sleeve. Cut from the midpoint of the 1st cut to halfway up the front of the sleeve. Cut from the midpoint of the 1st cut to the back neck point. Cut is from the midpoint of the 1st cut to the front neck point. 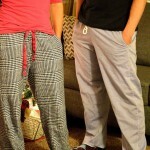 Now you can lightly pull on the front and back shoulder seams to expand the shape. The pieces at cuts 2 and 3 will overlap. You will more than likely NOT need a big change here. My total amount added was 1/4″ to both sleeves. I taped all my pieces with another sheet of paper behind it. Then I use my new sleeve pattern when I’m cutting out my pattern. That’s it! Now that I have my pattern piece taped up with the broad shoulder adjustment, I’m able to sew up the Nancy Raglan quickly! Oh my gosh. A Facebook friend sent me your link. Have to try this. Thanks so much. How would you do a forward shoulder adjustment? Thanks!